It's been a while since last time you bought something from RCHeliGears, the RC aircraft market has been changed quite a lot because of the popularity of drones. I agree drone is fun especially for beginners who has no experience in any RC aircraft, the convenient and easy control make the newbie pilot comfortable when the drone is in the air. However, in my mind, RC helicopter is still the king of radio control models in terms of skills, knowledge, and maintenance. If you are a die hard traditional helicopter fan, it's not the best time for you, as the cost of RC heli is getting lower, and the quality and design keeps improving, which you can see from the newer products from Align, the air frames are getting lighter, the motors are getting more powerful, and the costs are amazingly going lower, which is a good news for you(and me). Even though Align has just pushed all "L" series helis to "X" by redesigning the frames, but they are still giving a favor to the other pilots, so they just released the T-Rex 700L V2 super combo, which is the improved version of the previous 700L, but integrates most of the improved parts from 700X, such as the flybarleaa rotor head, CNC thicker main gear, rigid tail gears, and 800MX 520KV brushless motor. This is more than enough for any pilots from beginner to expert level, and the most important is the price is almost equal to the previous 550L super combo ! 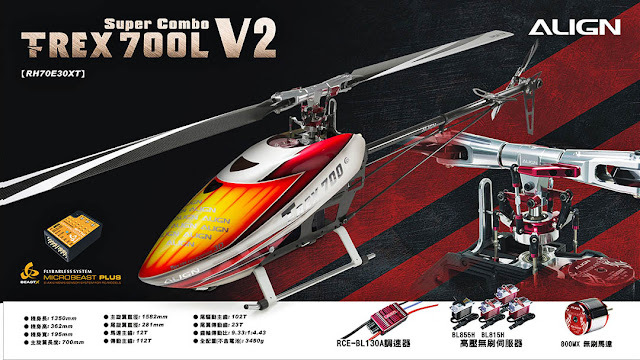 Don't miss the chance if you are still into RC heli world as before.